Today (21st April) is the traditional date given for the founding of Rome. According to Roman mythology, the founders were Romulus and Remus, twin brothers and supposed sons of the god Mars and the priestess Rhea Silvia. The twins were then abandoned by their parents as babies (because of a prophecy that they would overthrow their great-uncle Amulius), but were saved by a she-wolf who nursed them. 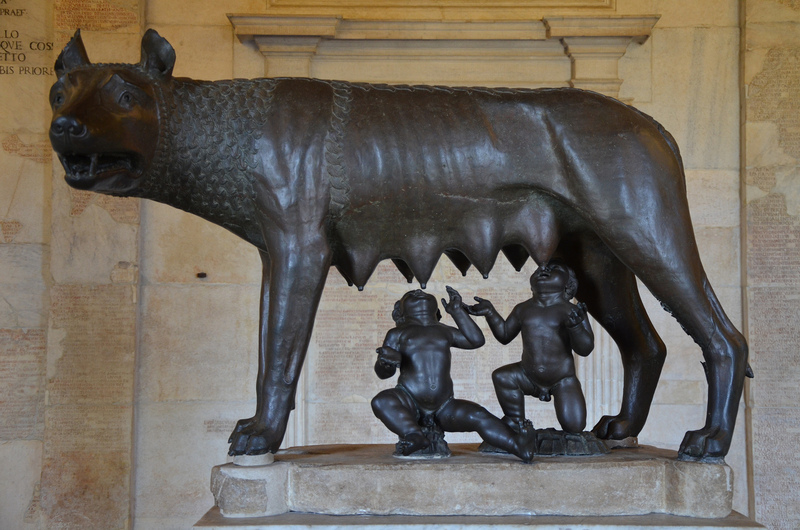 Romulus killed his brother after a vicious quarrel and went on to establish a city which he named after himself. Although the original date given by Roman historians for the founding of Rome varied between 758 and 728 BC, the official date was set as 753 BC. 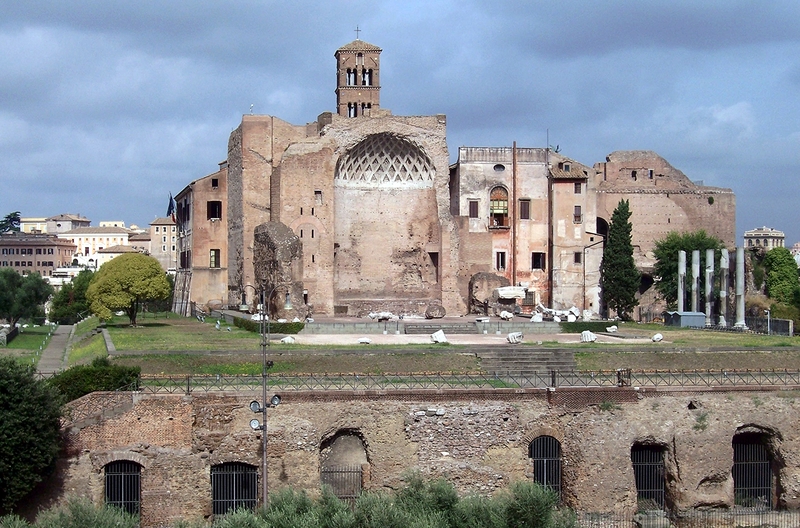 Archaeologists have traced evidences of villages on the Palatine Hill dating back to around the 9th century BC. The ancient Romans celebrated the founding of their city every April 21st in the festival of Palilia. This festival was originally aimed at cleansing both sheep and shepherds in honour of Pales, the goddess of shepherds, but was later associated with the founding or Rome. 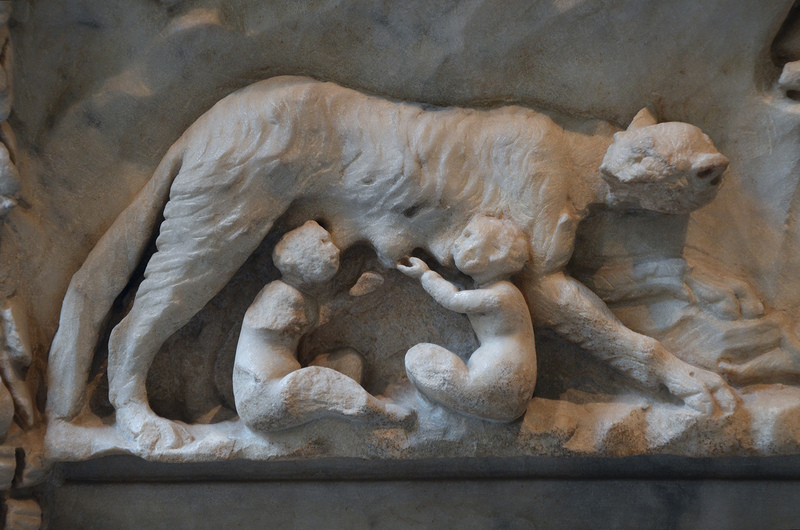 The connection between these two characters of the festival is evident as the founders of the city, Romulus and Remus, grew up to be shepherds like their adoptive father. This panel comes from a sacrificial altar dedicated to the divine couple of Mars and Venus found at Ostia (Italy). 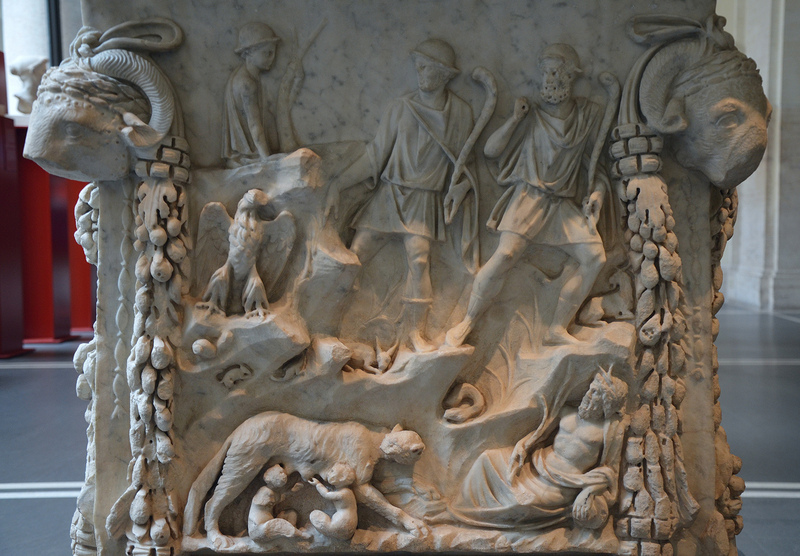 This side of the altar shows a scene with the she-wolf nursing Romulus and Remus, a personification of the river Tiber, and two fleeing shepherds, probably Faustulus, adoptive father of the twins and his brother Faustinus. On the left is the personification of the Palatine, also dressed as a shepherd. The eagle of Jupiter, symbolically hovering over the sacred grotto of the Lupercal, indicates that the events are unfolding under divine auspices. The altar carries various inscriptions. One of the inscription tells us that the altar was later used as a pedestal for a bronze statue of the god Silvanus. The consuls mentioned in the text inscribed securely date the inscription to October 1st, 124 AD. In this period Hadrian promoted renewed interest in themes related to the origins of Rome. This aureus of Hadrian was struck in 121 AD to commemorate the circus games that marked the 874th birthday of the city of Rome. The reverse of the coin depicts the Genius of the Circus Maximus with the legend “ANN. DCCCLXXIIII NAT. VRB. P. CIR. CON.” meaning that in the 874th year, circus games were for the first time instituted (Circenses constituta) for the natalis urbis romae (birthday of the city). In the same year, while celebrating the Parilia festival, Hadrian founded a new temple dedicated to Venus, the divine ancestress of the Roman people, and to Roma herself. The temple was to stand on the north side of the Sacred Way on a great podium, stretching from just beyond the Arch of Titus and almost as far as the Colosseum. The two goddesses would be placed back to back with one cella facing toward the Colosseum, the other facing towards the Forum. As Dio Cassius tells us, Hadrian himself seems to have personally designed the temple. However, construction of the temple did not begin until 125 AD. Having dedicated the temple, Hadrian changed the name of the Parilia festival to Romaia (the Natalis Urbis Romae) and associated the new Temple to the celebrations of the birthday of Rome. In addition Hadrian retraced the sacred boundary of the pomerium, the original line ploughed by Romulus around the walls of the original city. In doing so, Hadrian renewed the festival of Parilia in associating himself with Romulus. One other coin minted in Rome in the year 121 proclaimed a new Golden Age (saeculum aureum). HADRIAN, Gold Aureus “Saeculum Aureum” Rome Mint, 121 AD. This gold aureus featured on the reverse the Genius of the golden age “Saeculum Aureum” holding the zodiac and the phoenix on a globe, suggesting rebirth and renewal. Through this type of coin, Hadrian aimed at bringing the empire to its pinnacle while emphasising the power of Rome within the vast empire.